On Wednesday 7 November 2018, George Hepburne Scott successfully persuaded Mr Justice Garnham to quash an order of Extradition that had been earlier made at Westminster Magistrates’ Court. The client, JK, had been ordered to be extradited to Poland for a series of banking frauds from 2006. George successfully appealed the order on Article 8 grounds and the client was released. U.K. Extradition Lawyer provides highly expert specialist extradition advice and has extensive experience of human rights issues. George Hepburne Scott instructed in complex mafia extradition involving Spanish security service. A Brit accused of helping to run a £60million Mafia-style timeshare con was "sold down the river" after risking his life as a secret agent, his legal team claims. Spanish police say Paul Blanchard was the financial advisor for a scam led by Mohamed Derbah - once the enforcer for gangster John "Goldfinger" Palmer. But he insists he was helping a Spanish secret service probe on Derbah. Blanchard, 73, is fighting extradition and celebrity barrister George Hepburne Scott said: "Mr Blanchard has been sold down the river by the Spanish authorities. "He gave information at considerable personal risk." 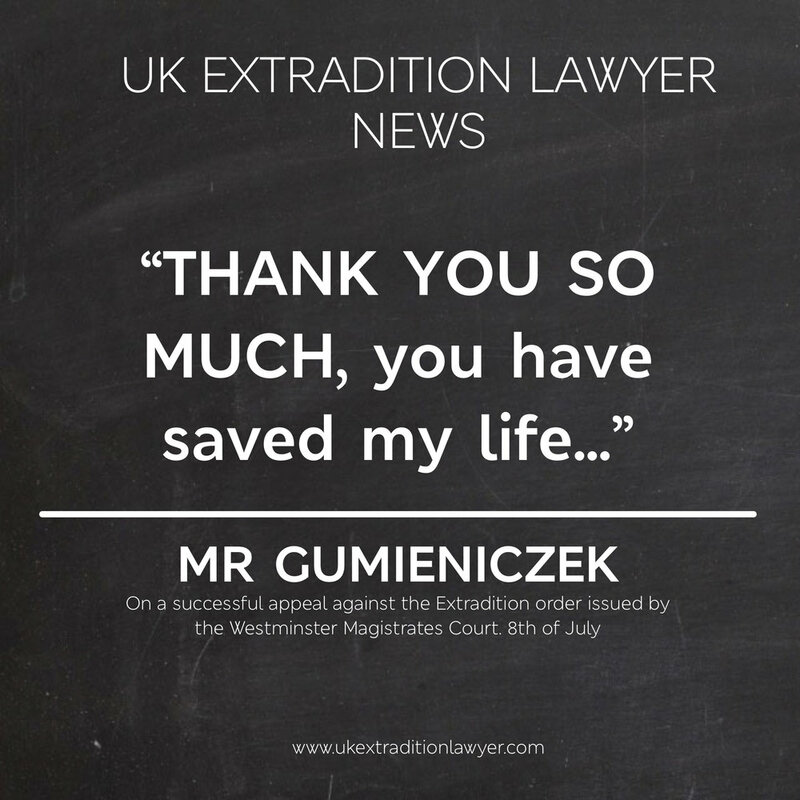 On Monday 8th July, following a successful appeal against the Extradition Order issued by the Westminster Magistrates’ Court, in the case of Gumieniczek v Poland, the High Court quashed the Order for Extradition and the client was immediately released. Our challenge was based on the aggregation of the sentence with non-extradition offences, a point that had been missed by the original Solicitors. Ms C-V was today discharged at Westminster Magistrates’ Court bringing her 18 month Extradition nightmare to an end, thanks to UK Extradition Lawyer. Our team headed up by Barrister George Hepburne-Scott, tirelessly fought the extradition request launched by the Republic of Ecuador. After we coordinated legal action in London, Quito, and the North America Court of Human Rights in New York, and following repeated legal applications in all countries, today the Ecuadorean Government finally conceded defeat and withdrew the extradition request. Ms C-V was extremely relieved and is now free to get on with her life. Brand New Article from New Law Journal UK by George Hepburne Scott - EAWs: is Poland on a Final Warning? The full article can be found here. Or download here. EXTRA #60Mins | Michael’s Herba's lawyer, George Hepburn Scott points out the number of anomalies in Chloe Ayling's case that make it "at the very least, an extremely unusual kidnapping situation." On Wednesday 24 January before Sir Wyn Williams sitting as a High Court Judge - George wins an Extradition Appeal (Polish case), (ii) On 25 January before District Judge Baraitser, George objected to the Requesting Authority's application to adjourn and the Judge agreed and forced the Requesting Authority to go ahead and the Defendant was discharged and released (Romanian case), (iii) On 26 January before District Judge Goldspring, client was released having been discharged following successful opposition to the Polish extradition request. George will join an panel of globally renowned academics and practitioners and deliver a lecture based on his article published on New Law Journal (Lexus Nexus UK) published in July 2017. The lecture will focus on recent developments in the law surrounding s.2 of the Extradition Act 2003 since the landmark case of Palar v Court of First Instance, Brussels where George appeared as counsel for the requested person and set a precedent regarding the level of detail required to satisfy s.2 in accusation EAW's that has been developed and refined ever since. Details of the lecture have also been published on the International Extradition Portal and can be viewed here. The quote of a client M.F. whose Appeal was finally granted by Consent Order from the Administrative Court on 1 December 2017. M.F. 's extradition was originally ordered by the Westminster Magistrates' Court on 10 November 16, then his initial appeal was refused by the High Court on 24 January 17 and then refused again at an Oral Renewal Hearing 16 February 17. However on 3 March 17 George successfully applied to stay the extradition pending the outcome of the Romanian Article 3 appeals (Greku & Ors v Romania). This stay was lifted after the initial hearing in Grekutended to go against usand the Appellants' extradition was scheduled for 12 April 17. However, on 11 April 17, George applied again for a stay of extradition and this was again granted by the High Court. This led to months of legal argument and ultimately, the Respondent Judicial Authority (Romania) conceded defeat on Article 3 grounds and, on 1 December 2017, the High Court sealed a Consent Order quashing the Extradition Order of 10 November 2016 and ordering the Appellant's discharge. We will continue to always ruthlessly advance our client's rights.